The apparitions began in November 1981 when six young girls and one boy claimed to see the Blessed Virgin Mary and Jesus. But only the visions of the first three -- 17-year-old Alphonsine, 20-year-old Nathalie, and 21-year-old Marie Claire -- have received Bishop Misago's solemn approval. Because there were reservations about the other four visionaries, and the supposed visions of Jesus, Bishop Misago didn't confirm the authenticity of either those visions or visionaries. The Virgin appeared to them with the name "Nyina wa Jambo", that is "Mother of the Word", which is synonymous to "Umubyeyl W'iamna" that is, "Mother of God", as she herself explained. 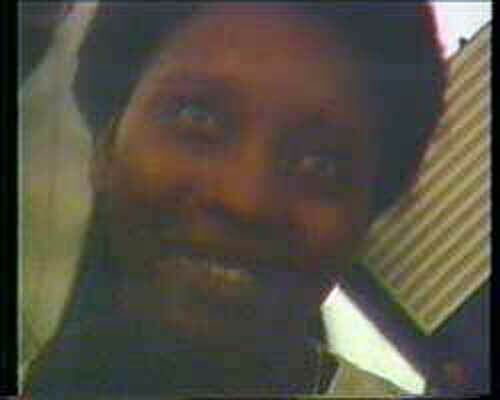 Our Lady begins appearing to Nathalie Mukamazimpaka for nearly two years. 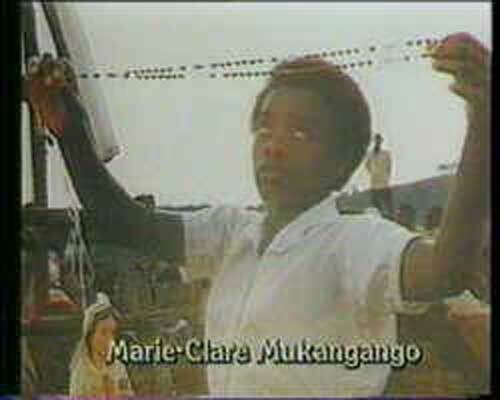 Our Lady begins appearing to Marie Claire Mukangango for 6 months. Bishop Jean Baptiste Gahamanyi appoints a medical commission, and later a theological one, to investigate the reports. He then authorized public devotion. 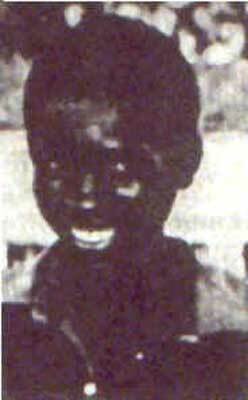 The local Bishop approved a public devotion linked to the apparitions of Kibeho. The last of Alphonsine's visions -- exactly eight years since the first. John Paul II visits Rwanda and exhorts the faithful to turn to the Virgin as a simple and sure guide, and pray for greater commitment against local divisions, both political and ethnic. Construction begins on Marian sanctuary called "Shrine of Our Lady of Sorrows"
The vision is now considered a prophecy of the ethnic genocide that would take place in the country 13 years later. Tragically, in 1994, visionary Marie Claire became one of its victims. On the solemnity of Sts Peter and Paul, during a solemn Mass concelebrated in the cathedral of Gikongoro, Bishop Augustin Misago presented his declaration on authenticity of the apparitions. The Holy See released the declaration of Bishop Augustin Misago of Gikongoro approving the apparitions. 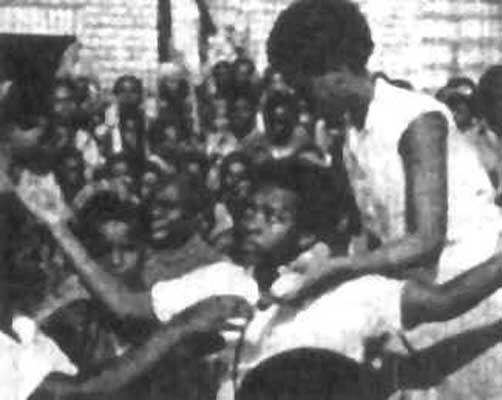 Declared valid were the apparitions to three visionaries: Alphonsine Mumureke, Nathalie Mukamazimpaka and Marie Claire Mukangango. Bishop Augustine Misago of Gikongoro announced that the celebrations for the 25th anniversary would begin on Nov. 28, feast of Our Lady of Kibeho. In his message, Bishop Misago says that "to celebrate worthily the Jubilee Year we must make concrete acts in the light of the message of Kibeho." Among them, he suggests: "praying during the year for all the intentions of the Pope; increasing participation at Mass and reception of Communion; receiving the sacrament of reconciliation." The bishop also urges "striving for reconciliation with enemies; asking forgiveness of people we have offended; respecting others; being tolerant in the family, with neighbors, at work, in meetings and other social events." Meeting with the Rwandan bishops for their ad limina visit Thursday, Pope Francis urged them to be be agents of reconciliation, commending them to the Marian apparition at Kibeho. "I commend you all to the maternal protection of the Virgin Mary," Pope Francis told the nation's bishops. "I sincerely hope that the Shrine of Kibeho might radiate even more the love of Mary for her children, especially the poorest and most injured, and be for the Church in Rwanda, and beyond, a call to turn with confidence to Our Lady of Sorrows, who accompanies each of us on our way that we might receive the gift of reconciliation and peace." 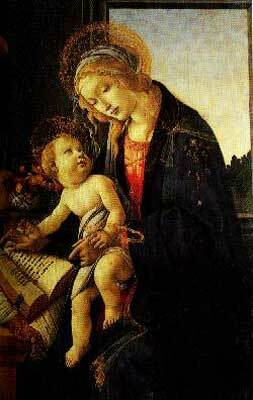 In the visions, Mary emphasized the call to pray the rosary. She also asked for penance and fasting. A dreadful vision all three girls received became a key apparition leading to the official acceptance and approval of Kibeho. These girls reported seeing a gruesome picture: a river of blood, people who killed one another, abandoned bodies with no one to bury them, a tree on fire, an open chasm, a monster, and severed heads. The vision is now considered a prophecy of the ethnic genocide that would take place in the country 13 years later. Tragically, in 1994, visionary Marie Claire became one of its victims. Click here to read the messages of Kibeho. 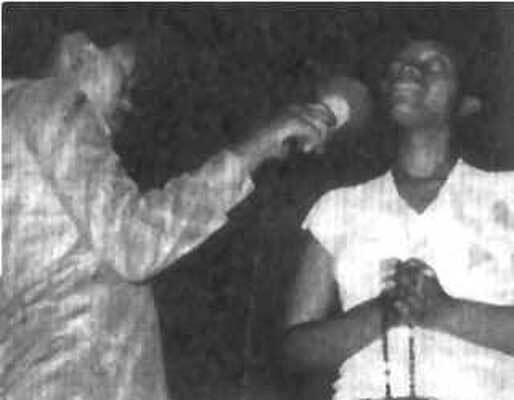 From the beginning in Kibeho, in southern Rwanda, there were conversions, prayer meetings, pilgrimages, healings and abnormal phenomena during those public apparitions. Also, the sun appeared to pulsate, spin, or split in two -- a miracle reminiscent of Fatima. "She had a seamless white dress and also a white veil on her head. Her hands were clasped together on her breast, and her fingers pointed to the sky... I could not determine the color of her skin," said Alphonsine, "but she was of incomparable beauty." 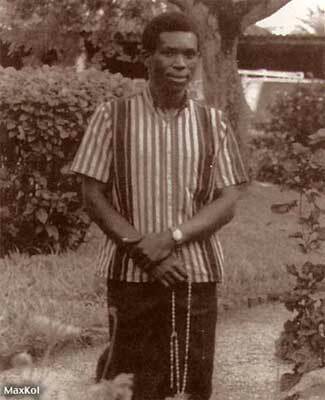 "Yes, the Virgin Mary did appear in Kibeho on Nov. 28, 1981," and then over "the course of the following six months," proclaimed Bishop Augustine Misago of Gikongoro, Rwanda, Africa, when he announced his official approval of the apparitions in July. "There are more reasons to believe this than to deny it." He could not confirm the veracity of all the people who reported apparitions, however. Moreover, the document does not consider the alleged visions of Jesus, reported from 1982. The visions in Kibeho, Rwanda, are the latest Marian apparitions to receive official recognition by the Church, which normally involves an investigation by the bishop of the diocese. 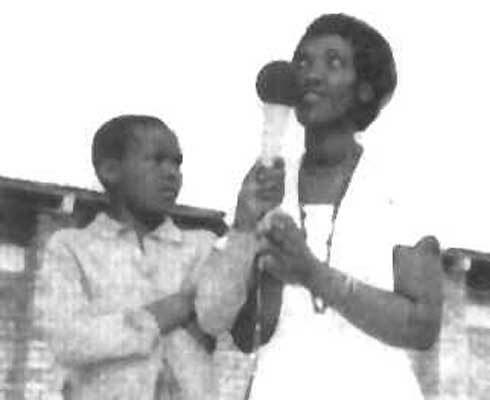 As early as 1982, an earlier bishop of the diocese, Bishop Jean Baptiste Gahamanyi, already authorized public devotion. The feast of Our Lady of Kibeho is Nov. 28.
we are here before you to contemplate You. even though we do not see You with our bodily eyes. to repent, and to live according to your Son's Gospel. fragrance everywhere and upon everyone. may we live eternally with You in the kingdom of Heaven. Daniel, Ange. Kibeho, le ciel à fleur de terre: des apparitions de Marie au Rwanda. Nouan le Fuzelier [France]: Editions du Lion de Juda, 1985. Maindron, Gabriel. Apparizioni a Kibeho: annuncio di Maria nel cuore dell'Africa. Brescia: Queriniana, 1985. 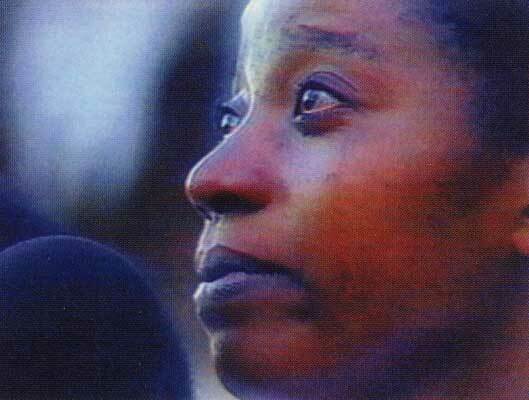 Kibeho: Mary Speaks to the World. 50 minutes. National Shrine of Kibeho, Rwanda; Entrusted to the Congregation of the Pallotines.